The Twins have received huge in-season turnarounds from a whole bunch of players — several of whom the Twins had no realistic reason to expect would do this. *Eddie Rosario: The 25-year-old outfielder had a dreadful start to the year. By mid-June, even after some slight improvement, he was a bottom-of-the-order hitter with an OPS sitting at .676. It was fair to wonder if he was ever going to figure things out, even as talented as he is. But from June 13-now, Rosario is hitting .318 with a .937 OPS. He’s found a way to be aggressive while adding an element of patience to his plate appearances, and the results have followed. 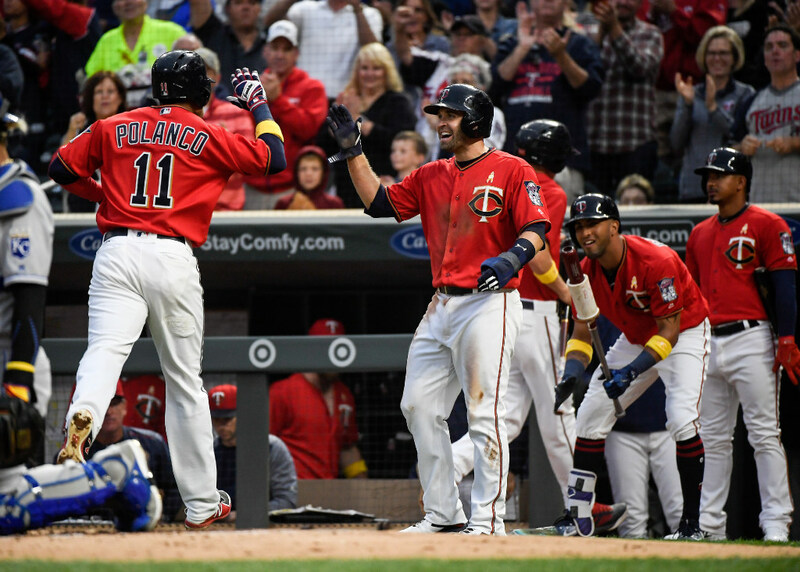 Rosario has 12 home runs and 35 RBI in 40 games since Aug. 2 as the Twins have surged. He’s had plenty of big hits — perhaps none bigger than his extra-inning walk-off home run Wednesday to rescue the Twins from a potentially bad loss. *Joe Mauer: Like Rosario, Mauer had a dreadful start to this season, finishing April with a .225 batting average and .546 OPS. He fought his way back to numbers consistent with what he’s been delivering in recent years — average in the .270s, not much power — which was better than his start but still subpar for a first baseman. But from Aug. 10 until now, Mauer has raised his average from .268 to .306 by going 51 for 124 (.411) in that stretch. The Twins have gone 19-13 in those games. Mauer is now sixth in the American League in batting average and fourth in on-base percentage (.387) and looks as close to the Mauer of old as we’ve seen in several years. *Brian Dozier: The Twins second baseman wasn’t having a bad season this year, but it certainly looked for a while like his 2016 season (42 home runs) was an anomaly. Dozier was hitting .242 with 17 home runs on Aug. 3, right about the time the Twins turned things around. Since then, he has 13 home runs, a .404 on-base percentage and a 1.017 OPS. He’s also scored 37 runs in 39 games. He has a team-high 30 homers and is using all parts of the field more consistently than I’ve ever seen from him. *Jorge Polanco: This might be the most stunning turnaround of all. Polanco’s batting average was all the way down to .213 at the end of an awful July, and he had become at least temporarily a part-time player. But since the start of August? Polanco is hitting .350 with eight home runs and a massive 1.045 OPS. Like Rosario, he went from a bottom-of-the-order guy to a middle-of-the-order mainstay. *Byron Buxton: At the start of this Twins surge, Buxton was hitting .219. He was worth having in the lineup for his other-worldly defense, but he was a liability at the plate — again. Since Aug. 2, Buxton is hitting .308 with a .943 OPS. He has nine homers and eight stolen bases in that span. *Matt Belisle: The Twins didn’t do much in free agency to address their bullpen, so by default the low-level signing of the veteran Belisle was scrutinized when he had some major early struggles. His ERA in mid-June was a dreadful 8.59 — mostly because of four terrible outings in which he allowed 18 earned runs in two innings (yes, you read that correctly). But he didn’t allow an earned run in any of his 11 July appearances. When the Twins traded closer Brandon Kintzler at the end of July, Belisle more or less became the closer. Since then, he’s converted 7 of 8 save chances with a 2.84 ERA. He got the win Wednesday after getting five big outs. Add it up, and it’s a pretty stark turnaround. It’s not like the seven players above were incapable of this, but for all of them to do it at once after the way their seasons were going? It’s pretty amazing.